So what is "Cant". Well its just like it sounds, a part of the rifle is canted. Cant is really common on early model Romanian rifles and less common on newer models. Cant is found by looking in two places on the rifle. The first place is the Front Sight Block(far left in picture) and the second is the rifle's Gas Block/Tube(far right in picture). Look at the picture below if you need help finding there location. 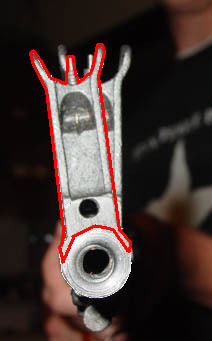 The first place to look is the front sight base, look at the picture to the right, the front sight base outlined in red is canted while the one in the background in not. When shopping for a AK don't look directly down the barrel like I did in the shot because you will look like a idiot. A Canted front sight block is just a looks thing; I have seen some very canted rifles shoot perfectly straight. Also Cant can be either way to the left or right and vary in how severe of an angle it is Canted. The second place Cant is common is on the gas tube. The picture to the left depicts looking at the rifle head on if the Front Sight was transparent. Notice how the gas block (the dark grey looking thing) is canted compared to the other one. 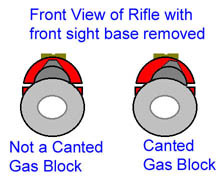 Cant on a gas block can be serious, if the Cant is just a little then its not to much of a problem, but if it is canted severely it can cause problems with the rifles gas piston leading to jams and malfunctions. Lucky Cant can be fixed three ways. First, you could call Century International Arms up and ask them to fix it, they will usually do this for free, but people have mixed results with them. Second, you could try to find a gunsmith willing to do it, but this can get expensive. Third, you could fix it yourself by following my "Fixing Cant/Front Sight Block Replacement" tutorial.